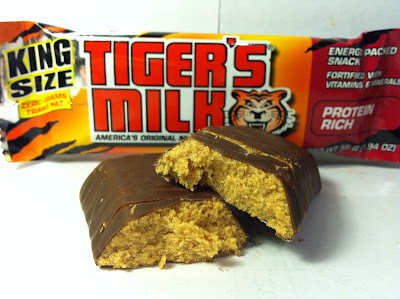 It was a lazy Sunday and I was meandering my way through the pharmacy section of Walmart looking at the various protein and nutrition bars that they had available and I came up on this: the Tiger's Milk Snack Bar. Having never seen this ANYWHERE before, I was immediately intrigued by the name. 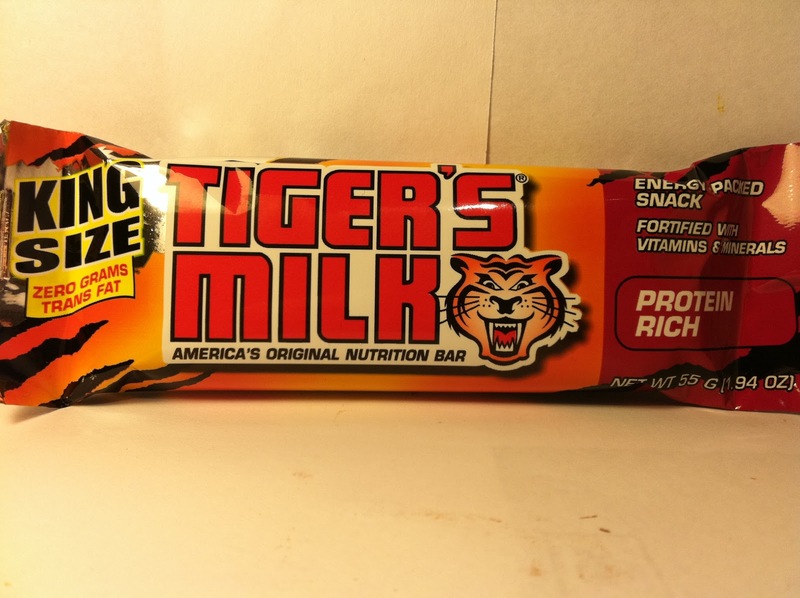 Seeing them proclaim themselves as "America's Original Nutrition Bar" (it was introduced in the 1960s) had me even more interested and I figured that for $0.99, how could I go wrong by picking one up? For this to be the oldest bar in America, it must be good, right? This "King Size" bar is a reasonably sized bar at 1.94 ounces (smaller than a Snickers) that packs 220 calories and ten grams of protein. 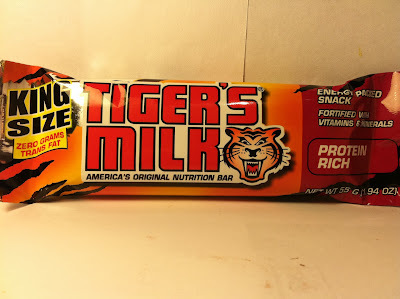 For a product whose packaging includes the phrase "PROTEIN RICH", I would have expected a little bit more than ten grams, but whatever, I was just hoping it would make me growl like a tiger! Sorry, I can't get over such an absurd name for a product. Coming into this, I had no idea what to expect this bar to be. There's no flavor description on the packaging, so all I had to go on was the ingredients on the back and after looking at those and seeing peanut butter, I figured it couldn't be all bad. Although, it does include America's current favorite food enemy...High Fructose Corn Syrup (HFCS). Personally, I don't care about HFCS, but a lot of people do, so that is a word of warning. After unwrapping the bar, I saw what you see above. From outward appearances, this appears to be a peanut butter base (with the obligatory protein mix) covered in chocolate. That's a good flavor combination, so it's a decent start. Well, it's a good flavor combination and you can definitely taste both of them in there, but there's nothing all that special about it. The peanut butter taste is a little off, but that is due to all the "healthy" chemicals that they throw into this to make it an energy bar. It's not really chewy, crunchy or like the normal gummy protein mix...it's somewhere in between all those. The chocolate, while faint, does provide a definite chocolate taste, but it is nothing to write home about. All in all, this is just average. Buy It or Fly By It? FLY BY IT. For $0.99, it's not a bad value or a budget buster, but it's not a great bar either. Everything about it is just average. That said, I can't see how something that is so overwhelmingly average has managed to survive for around fifty years. Strange. Has the selection been so bad that something like this can last for so long? Regardless, if you are curious or just need a cheap snack, you can buy it, just don't be expect to either love this or hate it. I don't mind the HFCS either, but I hate when "nutrition" bars use hydrogenated oils. I just Googled TM bars after buying my first one in years and seeing, to my dismay, high fructose corn syrup. Not chocolate covered- carob. I remember the health food store in town carrying them when I was a kid in the 70's, and they cost about a buck back then too, when regular candy bars were a quarter. I think the brand recognition is responsible for the longevity. They certainly aren't as prevalent as they used to be, as they have been supplanted by a million other energy/protein bars. I would pay more for better ingredients. I always wanted to meet the person that milks the tiger to get the milk. Now there's a tough guy! Fry's sold them for a dime a piece just a few years ago.